David Brown - Backup Vocals on “2F2G-What you Feel”, “2F2G-No Reason”, "CITY-Dont Walk Away", "CITY-Lovin For Granted"
These guys are for real! Tandym is a Georgia based trio that have been described as "a shining light at the end of the alternative tunnel." Their music has also been called "Timeless." "We do what we like to do" says Scott Goodfellow, keyboard and lead vocals. "We're not trying to fit into any mold, we just create and play what we enjoy." This attitude is reflected in the story line of "What You Feel", the opening track of their new CD "2F2G ", which will be released in April 2000. "Every song on this album is from the heart and soul of this band" says Scott. "There was a lot of guts lying around when we finished writing this one." 2F2G is indeed gutsier, and with a bit more edge than their first release "City Out of Time". "This one is more guitar oriented than City was" says Scott. " 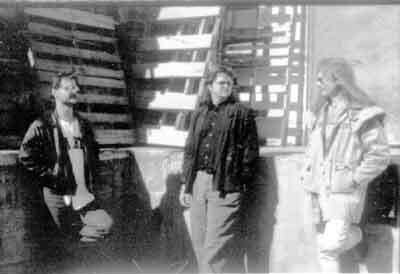 When we first put this band together, Jay and Jimmy had not played much with a keyboard player, and we exploited that particular sound. Don't get me wrong, I love the tunes on City, but 2F2G has more balls and we're extremely happy with this sound." 2F2G has taken these guys to a new level. It's still classic Tandym but this time it's a little more in your face and a lot more of the great music you would expect from a group of artists that could only exist ... in Tandym .